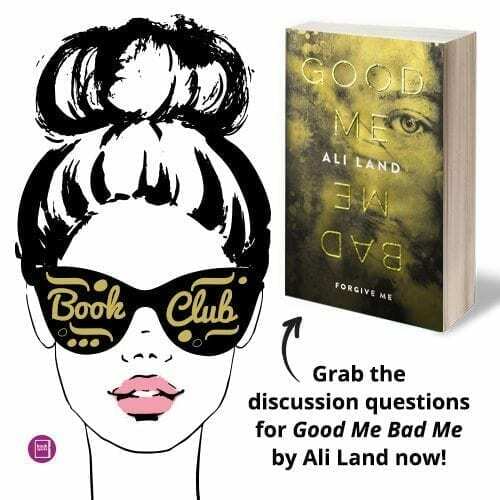 Our #BookSparksBookClub pick of the month is Good Me Bad Me by Ali Land. Have you grabbed your copy yet? Here are some discussion questions to get your wheels turning. Join the BookSparks Book Club Facebook Group and we’ll start chatting amongst our selves. Make sure you’ve signed up to receive the BookSparks Book Club email updates so that you get all the book club news! Join us for the LIVE BRUNCH chat with Ali Land October 5th 10a.m. PST/1p.m. EST. Use #GMBMchat to ask all your burning questions about this seriously dark and twisted novel! Follow @byAliLand and @BookSparks so you don’t miss a thing. Do you feel Milly/Annie turned on her mom to save other children or to save herself? Why do you believe Milly was still clinging to her mother’s love and lessons? How did moving into a foster family of fairly unstable people further effect Milly? Are Phoebe and Milly alike? Both victims of their mothers? Why did they seem to turn out so different? Is Milly responsible for her bad side or just a product of her mother? Is it nature or nurture that drives Milly’s actions? What is the healthiest relationship in Milly’s life now? MK, Morgan, Mike? Is she even capable of having real relationships? What role does guilt play in this novel? Are Milly’s “bad” thoughts a product of her mother or does she just have two sides like everyone else? Did Milly make the right choice with Daniel? Did she really spare him more pain? Don’t forget to join the BookSparks Book Club Facebook Group as we begin discussing these questions. And join us October 5th at 10a.m. PST/1p.m. EST! Use hashtag #GMBMchat to ask your questions.